The very thing that has always been the most dynamic, the most unpredictable, and the most confounding becomes the only real constant in an ever-changing part of the world. Morocco is developing, fast. 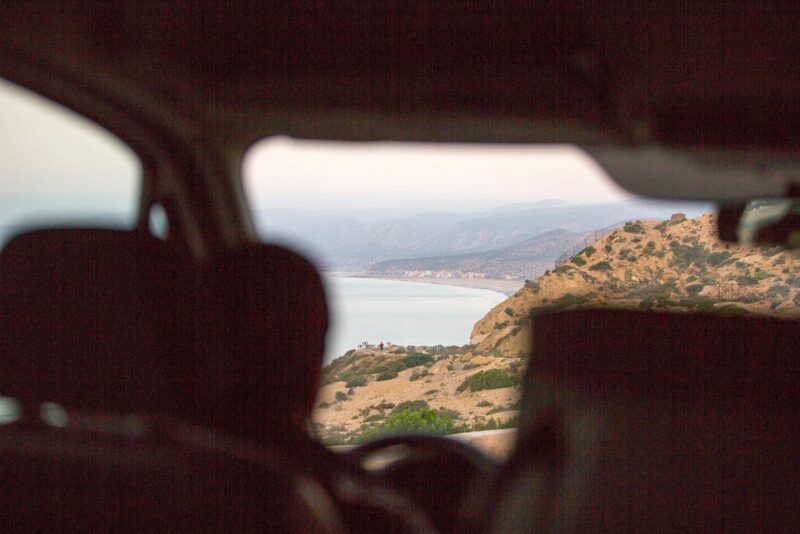 The last time I visited this little corner just north of Agadir a few years ago, the 2-mile stretch of coastline between Tamraght and Taghazout was essentially a flat, dusty wasteland, straddling a long, straight road connecting the two towns. Anytime you drove along this two(ish) lane strip of undulating tarmac (there was always, almost, room for 3 cars, depending on the severity of your death wish), you would see the archetypal ‘Moroccan scene’ playing out. Carts, always carts. Wooden carts filled to the sky with bottles, boxes, food, trinkets, and produce, pulled stoically along by an army of donkeys in silent protest. A sea of interested, intent faces – old women, kids playing football in the dusty open spaces, weathered men with stares that echoed the rigours of life, and dogs. Dogs everywhere, running, barking, sniffing, playing, scavenging for food, or just lying in the ditch dying or decomposing, after another horrific encounter with any manner of whizzing metal chariots rumbling along this black-top artery. Not anymore. It’s a 5am start, and the UK is on high alert. Snow is rapidly moving down from the north, schools are closing, and many flights are cancelled. The arctic vortex is upon us, and our departure window is getting smaller. My “Ford Mondeo of decrepitude” somehow wakes from its icy tomb and survives six hours on the road filled with board bags, camera pelican cases, way too much luggage, and a full crew. Check in, cross fingers, make a wish, and we are clear to take off. Gatwick-Casablanca-Agadir, here we go. “What the… where am I?” I recognise nothing. The road is gone; it’s now a town, a proper town. Where there was nothing, now there is, and it’s everywhere I look. I’m actually opening my eyes wider, trying to see, trying to understand the images passing by my window, trying to get a reference point, something familiar in the dark, anything. I scan the faces of my fellow travellers. They don’t seem alarmed. They’re either sleeping or simply gazing out the window. My head is spinning! Nothing, nothing makes sense. I’m lost in a place I once knew so well. We wind around a couple more sinuous curves before gently slowing down and stopping; we have arrived at the Sol House. Beautifully manicured pathways, a concierge in white, and an orderly patchwork of luxury wooden chalets illuminated by soft lighting greet us. Our bags are taken, and we are guided past a Malibu beach-house style setting – fully stocked bar, iridescent turquoise pool, hip ambient lighting, full moon, palm trees, with a midnight snack awaiting. I’m losing it. I’m still in Morocco, right? We collapse into the crisp white sheets of our luxurious cabins and freefall into the abyss of slumber, only to wrestle through the fog after what feels like barely a few minutes, succumbing to the persistence of our alarm clocks. We get up in the dark, try our best to sort boards and cameras, and have a quick breakfast before piling into the minibuses to start hunting for waves. After many visits to this amazing stretch of coastline, I have figured out that I will never really figure it out. There are the famous points – Anchors, Boilers, Killers – and quite a few more lesser known spots within an hour radius of Tagahzout. On their day these waves can be world class. I’ve never been here and not had good, fun waves. Never! The exposure to swell, and the multifaceted nature of the coastline means that no matter what the wind, or swell direction or strength, there is usually somewhere fun to surf. I’m also not sure I’ve ever been here and scored them at their best; I don’t really know how good it gets. Then there are the crowds. Taghazout has been on many a person’s radar for decades now, but it feels like recently there has been a real boost in interest, which is normal. Warm water, cheap living, quality waves, stable socio-political climate, decent infrastructure, an alluring culture, an abundance of surf camps, a steady stream of globally reaching high profile video clips and articles, and only a 3-and-a-half hour flight from London. There is also a very strong local surfing community. 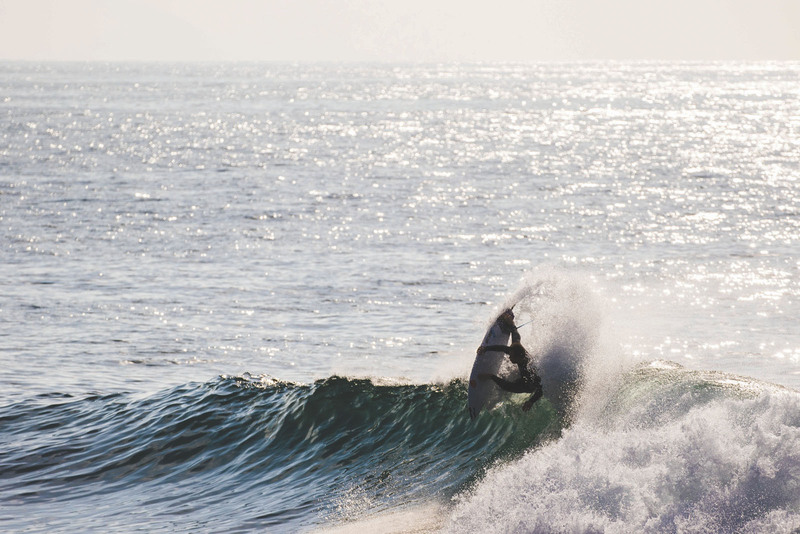 Morocco has long had some very good local surfers, but in recent times the level has gone up a notch. An expanding crew of world-class local surfers are ready tear apart any waves the Atlantic cares to dish out. They have grown up here and rightfully stake their claim whenever a set rolls in. House rules. If you get up early, and get to the right spot at the right time, you can still score perfect empty waves. Anyway, we are not all looking for the same type of waves to get our thrill on. Different levels of ability necessitate different canvasses. There are plenty of waves for everyone. We had assembled a fine crew, literally from all across the world. Leading the charge was possibly the greatest female surfer of our time, Carissa Moore. It’s easy to be impressed with edited video parts and beautifully shot pictures from perfect tropical surf trips, but it’s not until you get close to someone for a few days and surf with them that you get a real sense of the depth of their ability, and Carissa’s talent goes deep. Her positioning, clean rail work, and sharp fin blasts are consistently inspiring. Then, when she’s in the groove and starts busting out air reverses at will, it makes you realise just how good she really is. There is a real focus and controlled aggression when she’s in the water, which oddly seems to melt away as soon as she steps on land. It’s the type of transformation that gladdens the spirit and suggests you are in the presence of a comfortably balanced human. On one hand, a competitive athlete of the highest order, on the other, a normal young woman with an infectiously positive outlook on life. And then there was James Parry, or “Twinkle Toes”, or “The Cat in the Hat”. He jetted in from France, and unlike Carissa, he’s totally unadjusted – no balance, no yin and yang, no black and white. There ain’t no aggression in this horizontally skipping and dancing elf, it’s all just white and light for Mr. Parry. One of the most pleasant and delightfully delightful surf travel companions one could wish for. A playful, wide-eyed surfing minstrel. The only real major life issues seem to be the fact that he has been burdened with the gift of being able to ride one of those traditional “logs” – you know, 9’6 of beautifully crafted foam and fiberglass, made with no regard to high-tech weight reduction, no aerospace tech, just solid, clean lines. Even when poor James has to drag these aircraft carries around the globe with him, he doesn’t complain. Even when they don’t show up at the airport, he doesn’t mind. He just jumps on his 5ft-something fish and proceeds to gracefully adorn any wave that pops up, keen to share the stoke – not in an aggressive way of course! James is just a stoke miner, and once he’s collected a bag full, he’s one of those rare surfers that will actually happily share his stoke with you. Oh, and then there was the grommet of the trip, so good he’s got three names: Miles Lee Hargreaves, the Bude warrior. I’d never really surfed with Miles, and I was not sure what to expect. I guess the young surfers these days (ha, so anyone under 30) are all about airs, fin ditches, and grab variations, or slab hunting and big wave paddle surfing. (That seems rather popular with the kids now.) To be honest, Miles did most of that. Given the waves we had, I was particularly envious of his aerial prowess, tail-high full rotations and such, feats of dexterity I struggle to compute in my mainly one-directional processing facility. However, it is not his above-the-lip trickery that impressed me most; it’s very clear that young Miles is not afraid of laying down some serious rail when the occasion arises. He’s been training hard, and it shows. One particular wave will stay with me for a while: the biggest set of the session, comfortably overhead, Miles was in the spot, swung from deep and connected two of the cleanest, crispest forehand hooks I’ve seen in a long time. Simple, clean, precise surfing, delivered with power and flow. Ha, it almost looked mature! 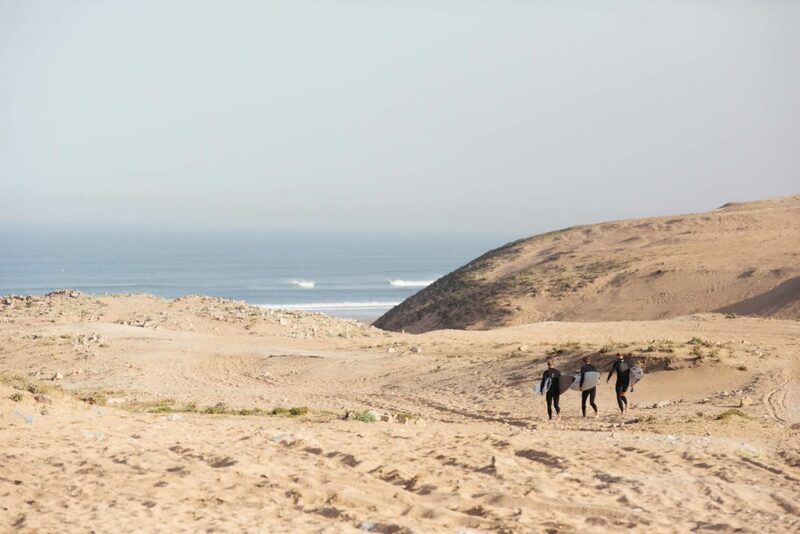 So, there we were, a jolly, diverse bunch of wave sliding enthusiasts looking for our North African fix, and this brings me back to the Sol House Tagahzout Bay Surf, our base camp for the week. In all my years of travelling the world’s coastlines hunting waves, I’ve never been to a place like this. Sure, I’ve stayed in Luxury hotels and resorts near good waves before, but it always felt like the waves were a happy coincidence on a developer’s masterplan, and that we surfers were never really the target market. (In fact, our dripping presence on the marble floors of the lobby usually did not go down too well at all!) Not here, though. This is a surf-centric and eco-friendly development from the ground up: the location, the proximity to Anchor point and Panoramas, and the beach right out the front, ideal for novice surfers. The team here, led by Francisco Gil and Younes Arabab, have really done something unique. There is a fully equipped surf school, with everything from high performance boards to SUPs and foamies, an amazing gym, and a video analysis room, and as far as the coaching staff goes, I don’t know how they managed it, but we surfed with three of the coaches over the week, and they all fully rip. Proper world-class surfers. Some are even past Moroccan champions. They are all super nice guys, a credit to the school and an inspiration to surf with. So yeah, the whole week was a bit of a surreal experience. Top-end accommodation, fine dining, a lively night time vibe thanks to a proper resident DJ, a fully-tuned surf centre that would be the envy of any global surfing powerhouse, wonderful staff and for all the sharers among you, decent WIFI . Yet as soon as you step back out onto the roads and go hunting for waves, there it is, the bedrock of Morocco and all it’s glorious sights and sounds hewn from thousands of years of cultural in influence and tradition. Morocco is warping, evolving, and changing, an evolution in progress, and places like this are right at the leading edge, where you can experience exotic culture in comfort and efficient style. The only constant? Those elusive perfect waves, still there, still calling as they have been for the past thousand years, just waiting for you to pick your moment to come dance with them. Special thanks to Tadenga Surf Village, the Sol House Taghazout Bay as well as Melia Hotels International, the Moroccan Tourism Board and Hurley.